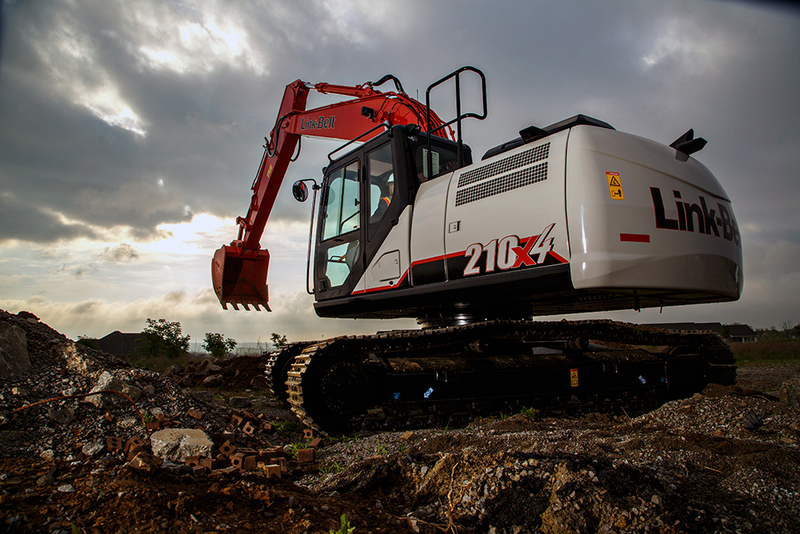 LBX Company announces the Link-Belt 210 X4 excavator for the US and Canada, featuring an electronically-controlled 160 horsepower Isuzu engine that meets EPA Final Tier 4 requirements, without the need for a diesel particulate filter (DPF). The mid-size 210 X4 is easy to transport and nimble enough to take on a variety of tasks, such as excavating foundations, placing pipe, stockpiling overburden, trenching, road building and truck loading. The ROPS and FOPS-certified cab provides improved operator ergonomics and comfort. A large, automotive-grade high-back seat offers unprecedented lumbar support and tilts to a 155° maximum reclining angle for a relaxed environment during breaks. Arm rests move proportionally with the console, which means that the distance and angle between joysticks and operator remains the same, no matter how the seat is adjusted. The 210 X4 features improved boss shaping on boom and arm pins to reduce stress; cast boom tips for improved reliability; and stronger cylinder mounts on booms and arms. Structural improvements on the lowers include an 8% thicker travel motor case; 14% thicker plating between side frame and travel motor case; 52% wider idler hub; and a shape change on side frames for easier cleaning.